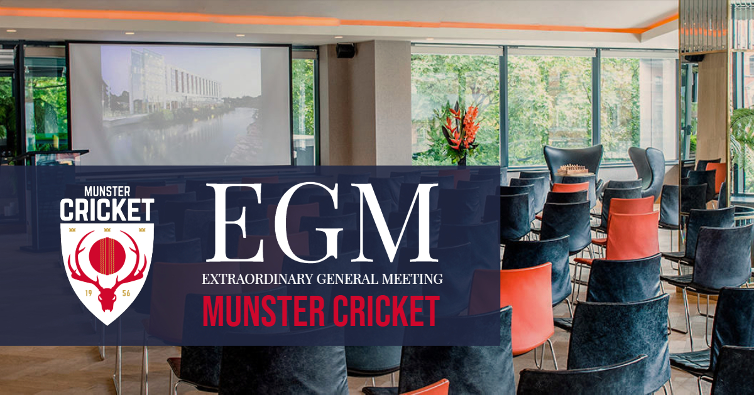 This EGM is called by the Executive Board of Munster Cricket (MCU) on Sunday, 3rd March 2019, starting at 2 p.m. in Room 4 at the River Lee Hotel in Cork. The purpose of the meeting is to approve and endorse two Notices of Motion from the Executive Board regarding the approval and adoption of Terms of Reference (ToRs) for the Executive Board and for 4 restructured Committees. This is to ensure our structures and governance is aligned with the Good Governance of Community, Voluntary and Charitable Organisations in Ireland, which shall be important in the future to ensure we continue to receive financial support from public funding and which is endorsed and supported by the Irish Sports Council and the second to approve and endorse the consequential changes to our Constitution to address the earlier committee structural changes and Terms of Reference (ToRs). The relevant documents containing the ToRs and the revised constitution and changes therein shall be circulated shortly, and well in advance of the EGM. This EGM notice Executive Board of the MCU are being circulated as required by our Constitution, to all affiliated clubs of our Union today, in advance of the circulation deadline of 21 days’ notice, exclusive of today. As permitted by our Constitution, it is being circulated by electronic means, as has been the case for AGMs and EGMs for several years now. It is being circulated to the relevant contacts of each affiliated club, based on information as circulated to me earlier this year. Attendance at the EGM is open to members of all affiliated clubs. Others may attend by invitation. In the event of a vote being required at the AGM, this is vested in the nominees of affiliated clubs (referred to as voting members). To facilitate due process, affiliated clubs are requested to inform me in advance of the names of their nominees (voting members) attending the EGM. These may be amended on the day if necessary. The number of votes which each club is entitled to cast at an EGM shall be the same as for an AGM, based on their league participation to a maximum of 3 votes per club, shall be indicated at the start of the meeting. The EGM shall be attended by some staff of Cricket Ireland and it is planned that when the EGM concludes, Joy O’Neill, Cricket Ireland Safeguarding Officer shall give a brief presentation on the recently circulated updated Child Safeguarding Packs and answer any questions on same, and Elaine Nolan, Cricket Ireland Participation Director shall give an update on Youth Cricket matters. This will not be part of the EGM as such but all shall be welcome to stay for this. You shall be updated in this nearer the date.